A few months ago we started talking about getting back in to biking. Not that we were ever avid cyclists, but there was a time neither of us owned a car and we got around exclusively by bike or foot. Then, I’m not sure why this is, we moved from downtown to our current location in suburbia six years ago and we put the bikes in the shed and never took them out again. I’ve been toying with the idea of doing a triathlon. We’ve also been camping in places where it would have been a lot of fun to have a bike. In fact, we are returning to one of those places this coming weekend. So both of us decided a good set of wheels would be great to have. About two weeks ago, I pulled the old bikes out, dusted off the cobwebs and took a hose to them. There was a little bit of rust on the frames, a lot of rust on the chains and the tires were all flat. Clearly, they needed some work to be road worthy again but they looked salvageable. I researched reputable bike shops in the area and found one pretty close to home that had good reviews. We took the bikes in and were quoted price of about $160 per bike, including tires. Compared with spending a few hundred or more on new bikes we considered it a bargain and told the guy to do what he needed to do and that we would see him in about a week. Two days later he called to say that after tearing in to them, he found the condition was worse than he thought and it wasn’t gong to be worth it to fix them. I would have been a bit leery had he not told us that he really didn’t have much in his inventory to sell us that would fit our needs. Then he gave us the names of a couple of competing cycle shops that might be able to help us. It’s that kind of honest business I like to support. I wish we could have bought something from him, but he was correct that he didn’t have anything to suit us. Our old bikes were Specialized, which is the main brand he sells. After we knew we were now in the market for new bikes I started shopping around online and comparing different brands and decided we probably wouldn’t be going with Specialized. Even if we had gone with Specialized, he said it would be two or three weeks before he could get anything in. Pretty much all the Specialized bikes he had in stock were multi-thousand dollar road bikes. He said the early Spring we had in the Midwest had severely depleted inventories and the bike manufacturers, particularly Specialized, we’re having a hard time keeping up with demand. Pretty crazy, right?! Well, we found two dealerships within a 50-mile radius that sold Electra bikes, which was the brand we had narrowed the search down to. On Saturday we drove the approximate half hour trip to the closest of the two shops and first found they had moved up the street. And then we made it to the new shop to find it was closed that particular Saturday for reasons not explained on the paper note hung on the window. What kind of bike shop closes on a Saturday in the middle of summer?! Guess they were definitely not interested in taking our money. So, off we went an additional 20 minutes to the second shop. They had Electras but not the particular model I was looking at which was a 21-speed. The salesperson assured me a casual rider like myself would probably not need at least 15 of the 21 gears. After test riding a few models, we were the proud owners of two Electra Townie 7-speeds. What we really liked about this particular model is that it has the comfort of a cruiser, but the durability of a mountain bike. The idea was to get something we could race around the neighborhood for good cardio workouts but something that would also be suitable for packed-dirt trails. So far so good! We went for a short ride Sunday morning and I went for an hour long ride Monday night. It’s been a long time since I’ve ridden a bike and I hadn’t realized how much I was pushing it until I stepped off the bike and my legs felt like jello. I was a little concerned I would be sore the next morning, but I stretched really good afterwards and I ended up feeling just fine. 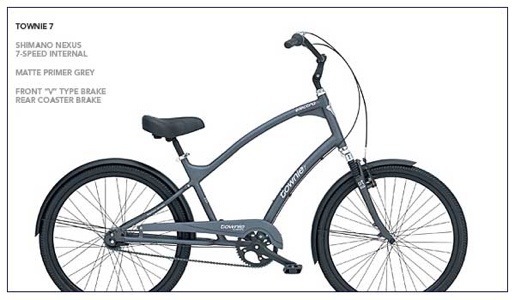 This entry was posted in Biking, exercise, Fitness, Half marathon training, health, Running and tagged Buying a bike, Electra, Electra Townie, Electra Townie 7. Bookmark the permalink.